My second picture from the Maasai Market in Nairobi, where the Maasai tribe sell products made by them. The main material that is used for making these crafts are wood, leaves and leather. The masks and wooden sculptures are most popular item in the Maasai Market, but at a glance you see that the shapes are not that original as expected and are designed especially for tourists. After the vendor tells you the price, they usually asks yours! As an Iranian I know how to bargain well, but I felt that Europeans had to pay double or triple the price even after bargaining. These traders know what they are doing. More than likely YOU end up paying more than the "fixed" Indian's price. I can tell you that they do not sell at a loss. Just enjoy the culture. 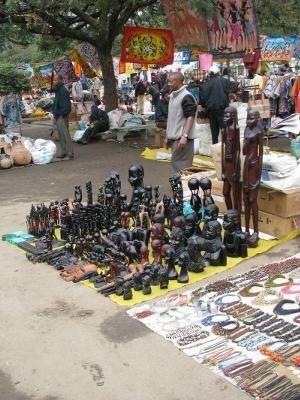 Even Kenyans bargain for everything they buy - that's the spice of Kenyan trading.